major lines today. 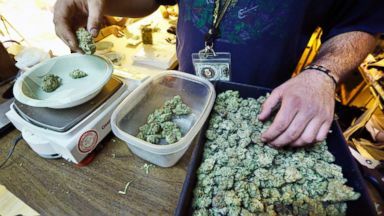 For the first time you can buy marijuana legally in parts of colorado purely for recreational use. Tonight there is already talk of shortages and a different kind of after effect, new jobs. Abc's clayton sandell in denver. Reporter: They lined up before dawn. We drove 17 hours to get here. Reporter: Some sleeping in their cars. It's a historical event. Reporter: For a chance to be early through the door at one of the world's first recreational marijuana shop. Even in amsterdam it's tolerated but technically illegal. 8 a.M. We're gonna do it! Reporter: Scoring weed now as east as buying a coffee. Sean, your total is $59.74. Reporter: Anyone over 21 can buy it, helping fuel a colorado green rush. We want to be the costco of marijuana. Reporter: In the first year sales are predicted to hit early $400 million. This room is filled with about 25 different strains of cannabis currently. Reporter: Shop owner toni fox is expanding and hiring. Today she has nine employees. By the end of january we should have about 30. Reporter: Matt brown started a company for pot tourists. He has 4,000 people on a waiting list. This is legal. This is real. And you can do this and have a good vacation and go home and not get in trouble. Reporter: But not everyone is on board. Marijuana is still a federal crime. There are worries about increasing teen pot use and driving while high. Even ski resorts here worried about a family friendly image are warning stoners to stay off the slopes. Here in public it is illegal. Reporter: Other states are now watching to see how this new experiment works out. As marijuana moves from the underground to the mainstream. Clayton sandell, abc news, denver. 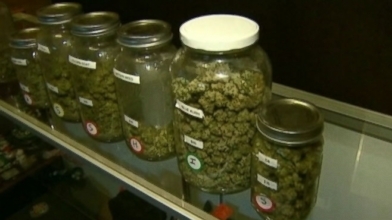 3D Cannabis Center in Colorado expects a line of customers when law goes into effect Jan. 1. Closely watched, the state becomes first to sell pot recreationally.